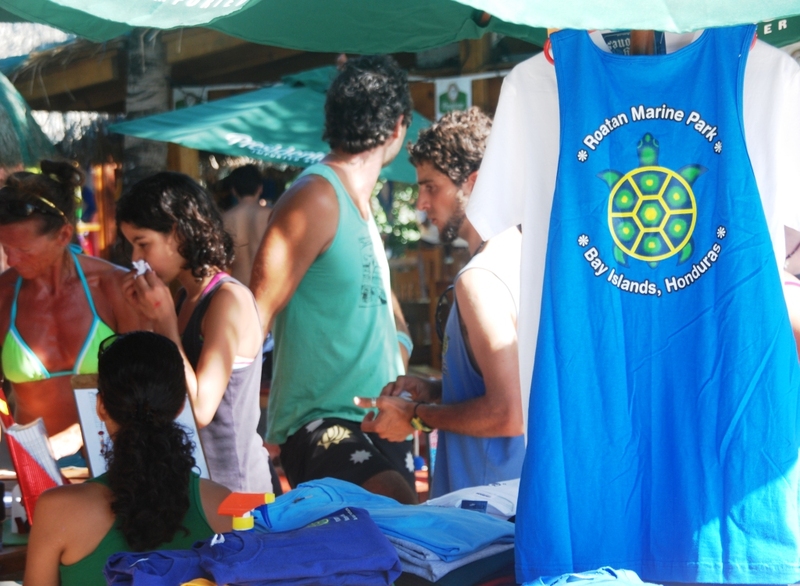 Last Saturday (April 9) was the Marine Park Bash at Bananarama on West Bay Beach; an annual fundraiser to assist the Roatan Marine Park with promoting awareness, preservation, and protection of the aquatic wonders of Roatan. A great time was had by all, and in-turn we were able to contribute in some fashion to their efforts. Last year I wrote and posted a story about the Marine Park on Roatan Vortex. My theme (you know how much I love the word theme) was Please Don’t Walk on the Coral. At the time I was looking to do my part to help visitors who, like me, had limited understanding of the importance of not stepping on coral. I mean—really—come on—it’s just a bunch of pretty rocks under the water… right? Through the Roatan Vortex, on Facebook, Roatan Radio, and best of all—in person I get to meet a lot of visitors to Roatan. Many know they shouldn’t step on coral, but, many really don’t know. There are a few signs posted at the beaches that simply say, Please don’t step on the Coral but without knowing why it matters, these signs quite often go un-noticed. One more thing: In case you missed last Saturday’s live show on 101.1 FM Roatanradio.com, listen in to Smile–It Confuses People right here! Excellent… well done and well thought!!! You should get them printed and put them up on all the beaches. I never laughed so hard as when we shot the pictures on the beach! EJ and I (Roatan Vortex) are going to get this out there… everywhere we can! Posters, t-shirts, heck we’ll even put it on coffee mugs if it helps save the reef! Hey Genny, great new article and important message about the reef. One other thing is to try to get it across to visitors to NOT buy the Conk shells, dried seahorses and starfish etc. I so want to see a live seahorse but if the locals and others don’t stop catching them and then killing them for money, I may never see one! I am not sure people realize that! Makes me sad. Thanks for sharing that important addition. Sad but true Without education people really have no idea the difference they can make in helping preserve the treasures around the world. What a great,fun & creative way to get the point across. PAAAAT had a great time playing with Mona. Can’t wait for the t-shirts. Never laughed so hard as when we did that photo shoot! 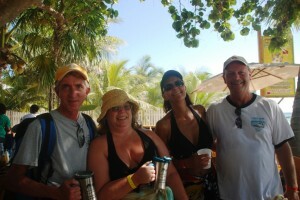 Paaaaat and Mona worked well together Be sure to come back to Roatan soon… it’s not the same without you guys here.